A false positive is an abnormal test result that unnecessarily promotes a patient to the next level of testing. It’s problematic, especially in today’s economic environment, because it places an additional cost burden on patients, the healthcare system, and insurance companies. It also exposes patients to higher risk invasive procedures, additional discomfort, and is ultimately an inefficient use of time. Once the prescribed isotope has been injected, it’s critical for the technologist to wait the suggested amount of time for blood pool and bowel clearance prior to imaging. Waiting the correct amount of time allows the technologist to evaluate the existence of any extraneous activity that may interfere with the heart uptake or imaging process. The technologist should also assure the rest images are satisfactory before proceeding to the stress phase of the exam. After the technologist acquires the data, it should be assessed for quality. Motion can significantly impact the quality of a study to the point where the patient may have to be rescanned. While there is software that can perform motion correction, a study that can be checked and action taken while the patient is still present offers the best results. Acquisition time should vary by patient based on their specific factors in order to ensure the appropriate count volume for every patient. That’s why the cookie-cutter acquisition protocol isn’t always sufficient. The technologist must be able to accurately calculate the sufficient minimum dose and how long the study should last for each individual patient. The best way to ensure accuracy is with a camera that prompts the technologist with the calculation. Additionally, software like Tru-ACQ™ can automatically calculate the imaging time required on a per-patient basis at the time of imaging regardless of patient size or dose, thus allowing for reductions in imaging time and/or dose. If your camera is ready to be replaced, you may want to consider a camera that is equipped with the tools to help you reduce the number of false positives. The Cardius X-ACT+ not only prompts the technologist at the appropriate quality control checkpoints, but it also includes the Tru-ACQ software package that calculates the appropriate imaging time based on individual patient variables. Attenuation correction for SPECT MPI is also a major differentiator, providing PET-like diagnostic value. Patients have the potential for normal artifacts or variances simply due to the natural anatomy of the body. Correcting for that with a tissue map is the best way to see through the artifacts that create these false positives. Last but not least, the X-ACT+ is built for patient comfort, which will inevitably decrease the chance of a poor diagnostic study due to motion. For more information on the Cardius X-ACT+ or any of the Digirad cameras, click here. A Holter monitor is a short-term, continuous monitoring device that tracks the heart rhythm of a patient with small electrodes that attach to the skin. The devices are typically worn for 24–48 hours and then returned for download and analysis. Event monitors offer longer term monitoring in which the patient can trigger a recording if they are feeling symptomatic. Some event monitors can auto trigger based on internal algorithms for tachycardia, bradycardia, pause, or atrial fibrillation. Mobile Cardiac Telemetry, or MCT, allows for longer term monitoring with the ability for patient or auto-triggered events based on algorithms. Generally speaking, MCT devices “sample” or “trend” ECG samples periodically throughout the day. The TCAT3 is a TELErhythmics Cardiac Ambulatory Telemetry device, which is designed for longer term monitoring. It collects every heartbeat in order to detect elusive arrhythmias. The patient can trigger recordings or the device can auto trigger based on internal algorithms for tachycardia, bradycardia, pause, or atrial fibrillation. Data is transmitted wirelessly for near real-time analysis. There are countless devices that allow physicians to offer cardiac monitoring services. To help you understand the differences between the various methods, we’ve compared the technologies in the chart below. A Holter monitor typically records cardiac activity for an uninterrupted 24-48 hours, although some are prescribed for up to 14 days. It is ideal for the patient who is experiencing symptoms on a more frequent or regular basis and whose condition does not require continuous monitoring. Mobile cardiac telemetry is prescribed for a period up to 30 days. It is typically prescribed for patients with rare or intermittent episodes, or those who may be asymptomatic. The extended wear time allows for the opportunity to capture an arrhythmia that may not occur during a shortened wear time and is also helpful in identifying a silent pattern of irregular cardiac activity. Holter monitors are designed to continuously record data. While their limited wear time reduces the inconvenience for patients, it’s also one of the reasons a Holter may be returned as non-diagnostic, or benign. Most often, this is because symptoms may not reappear during the time in which the Holter is monitoring the patient’s heart rhythm. Telemetry devices offer a variety of recording methods. Many MCT devices are continually listening, recording every heartbeat for up to 30 days, and provide atrial fibrillation burden assessment. Devices can store their data either locally or in the cloud. The data collected from a Holter monitor is stored on an internal chip and is limited in terms of space, but sufficient for the prescribed wear time. Telemetry device storage varies. It can be stored locally or transmit the information to the cloud, as long as there is a strong cell signal present. This feature is significant because the data can be read in real time and irregularities can be addressed immediately. This difference is especially prominent when compared to the 7-14 day Holter monitors. Any irregularity identified with a Holter monitor will not be read until the monitor is returned and analyzed at the end of the prescribed wear time, which could potentially be up to 20 days later. Both Holter monitors and telemetry devices require leads that are attached to the patient. Holter monitors typically require more leads and tend to be more bulky. As a result of the technology it uses, a telemetry device is smaller, sleeker and easier to wear. There are also differences in the ways the devices are powered. Based on the amount of wear time, Holter monitors may have batteries that need to be changed. Newer telemetry device models are rechargeable. They typically include two batteries, one to wear while the other is charging. Depending upon your symptoms, or lack thereof, your physician will prescribe the appropriate monitoring device. Both are completely painless and are considered highly effective ways to identify potential heart issues and to help determine the appropriate treatment. Cardiac Monitoring Service: Do cardiac trained RNs make a difference? While there are many variables to consider when partnering with a cardiac monitoring service, the reading expertise of the clinical staff is one of the most important. Cardiac monitoring services that employ registered nurses offer an undeniably higher level of readiness to their customers and their patients. Their expertise allows them to serve as an extension of the physician as they ask critical questions, provide comprehensive care, and a more holistic approach. In many cases, seasoned registered nurses, leveraging their experience, has been instrumental in identifying subtle but serious signs that may have easily been overlooked. For example, a particular case reported a patient was presenting a complete heart block, which was clearly cause to notify the physician. The patient was immediately directed to the emergency room in anticipation of surgery to implant a pacemaker. A monitoring staff nurse who was familiar with this particular patient noticed that he had taken a double dose of a calcium channel blocker that works by relaxing the muscles of the heart and blood vessels. She notified the physician, who cancelled his prior instruction for the patient to head to the emergency room and instead, discontinued the medication. The next day, the patient returned to normal sinus rhythm. This example was a situation where the nurse was able to provide information that helped prevent unnecessary treatment. In other instances, registered nurses are able to identify arrhythmias and triage patients who required an implantable device or other treatment, potentially eliminating an emergency response. Their expertise works both ways and across the full spectrum of care. In addition to the health considerations, the nurse who noticed the double dose of medication prevented a costly hospital visit for the patient. Even with health insurance, the patient would have most likely incurred a copayment, and the healthcare system would have incurred an unnecessary cost as well. Most of the interactions between patients and the monitoring service take place over the phone. Cardiac trained nurses are experts at listening for shortness of breath, difficulty talking, wheezing, rales and other signs that are not instantly visible on an electrocardiogram. Combining what they can see on an EKG with the information they gain while talking to a patient can make all the difference. All notifications from a monitoring service are potentially life saving. Given the critical nature of the data, a registered nurse who can more easily piece together a patient’s story, process it, and act quickly on that data is the highest level of care a monitoring service can provide. One-third of stroke and transient ischemic attacks are categorized as having no known cause, or cryptogenic. Recent studies have suggested that atrial fibrillation (AF) could be a possible cause for these cryptogenic strokes. If atrial fibrillation is known or suspected, early detection and monitoring is key. In a study reported in The New England Journal of Medicine, patients without known atrial fibrillation, who had had a cryptogenic ischemic stroke, were monitored by mobile telemetry for 30 days. The study concluded that 12-15% of strokes were possibly caused by atrial fibrillation and raised the importance of early detection. In addition to MCT, implantable loops are a new alternative that have also proven effective. These implantable cardiac monitoring systems are particularly useful either when symptoms are infrequent or when long-term data is required. Based on the NEJM study, the use of mobile cardiac monitoring to detect and manage atrial fibrillation can also reduce a patient’s risk for stroke. Early detection is critical to identifying preventive treatment before an AF-related stroke occurs. When do I use Holter, Event Monitoring, or Mobile Telemetry? When a patient reports symptoms of an irregular cardiac event, physicians can choose to monitor cardiac activity using a Holter monitor, cardiac event monitor, or mobile cardiac telemetry. Holter monitors are often a physician’s first line of defense when a patient reports symptoms of a cardiac irregularity. They are a non-invasive, wearable device that records the patient’s heart rhythm for a prescribed period of time during which the patient assumes normal, daily activities. Although it may be a low-cost, low-risk option, many physicians report non-diagnostic rates as high as 85%. Most often, this is because symptoms may not reappear in the 24 to 48 hours during which the Holter is monitoring the patient’s heart rhythm. A cardiac event monitor is another option and is often the next line of defense. Typically worn for 30 days, it is prescribed for patients whose symptoms occur infrequently. When the patient experiences an abnormality, he manually presses a button to record the preceding and following five minutes of the event. There may also be an auto-capture feature where the device records the information even if the patient is unaware of the activity. Advances in the technology now allow for the wireless transmission of the data via the cellular network. These newer devices also have enhanced programming and expanded storage capabilities. Cardiac event monitors store the recorded data, which is ultimately transmitted either to a physician’s office or to a central recording station. Mobile cardiac telemetry is the newest of the monitoring options. MCT devices are small portable monitors that, when a cardiac anomaly is detected, automatically send data. MCT devices provide even more information such as AFIB burden. The data is transmitted to a 24-hour manned monitoring center via a mobile network, and then interpreted by a qualified, cardiac-trained registered nurse. 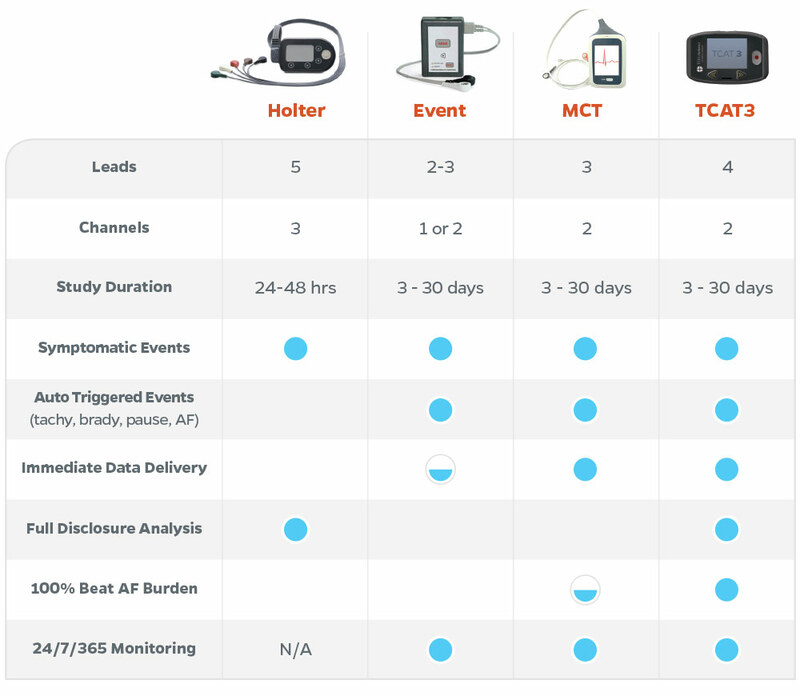 In contrast to the cardiac event monitor, MCT provides real-time monitoring and analysis. There are no official guidelines established for deciding which monitoring method is best for your patient; however some insurance companies have specific criteria for the use of Mobile Outpatient Telemetry. MCT devices have proven beneficial in patients with unexplained syncope, Cryptogenic Stroke and post ablation. Non-diagnostic Holter, Symptomatic Patient…Now What? When a patient expresses symptoms or exhibits signs of a cardiac irregularity, many cardiologists look to the Holter monitor as their first line of defense. While Holter monitors can be effective, it’s not uncommon for them to be returned as non-diagnostic. In fact, many physicians report non-diagnostic rates as high as 85%. Most often, this is because symptoms may not reappear in the 24 to 48 hours during which the Holter is monitoring the patient’s heart rhythm. Non-diagnostic Holters are also known as a benign Holter or a negative Holter. Cardiac irregularities should not be dismissed even when a cardiologist receives a non-diagnostic Holter. The suspicion of an arrhythmia warrants additional steps. Many cardiologists will prescribe the use of a Holter monitor for a longer period. If the patient’s condition is infrequent, or if the patient is asymptomatic, then a passive recording system could be a more appropriate choice. Some recording systems can be activated by the patient when he or she becomes symptomatic. Other systems utilize a Mobile Cardiac Telemetry (MCT) device that continually transmits EKG data back to a staffed monitoring center. If an abnormality is detected, the system will create an event and generate a report which documents the irregularity with full onset and offset as well as comprehensive ectopy reporting. Many physicians who do not own a Mobile Cardiac Telemetry system choose to utilize a service-based cardiac monitoring provider, such as Telerhythmics. A cardiac monitoring service company can allow you to offer the technology without having to purchase the equipment. Plus, if you’ve never used a Mobile Cardiac Telemetry system, they will teach you how it works and train your staff on how to provide the service. As always, regardless of which technology or service you choose, it’s most important to continue monitoring the patient until a diagnosis can be made. Mobile cardiac outpatient telemetry (MCOT or MCT) is an innovative technology that cardiologists use to monitor patients’ every day cardiac behavior. The technology that powers MCT is continually evolving and below are a few of the latest innovations we are seeing emerge. Traditional MCT systems have been two-piece systems that contain a receiver and a transmitter. The two-piece equipment contains wires that are attached to leads, which close the circuit from the heart to the receiver to the transmitter. Recent developments in MCT technology have created a one-piece device that can store data for up to thirty days. The one-piece device features a single receiver/recorder. One-piece designs are appealing to patients because they only have to worry about one piece of equipment, and it is less obtrusive. Extended Holter, or “patch” technology as it’s commonly known, is a “long term” Holter device and not MCT technology. Though the “patch” does not require wires, it is a two piece technology that requires data to sync to a remote device via Bluetooth technology. Though this “Band-Aid” Style Patch adheres directly to the patient’s chest without wires, it is fairly large at roughly 5 inches long, 2 inches wide and more than an inch thick. MCT devices are now integrating GPS technology and accelerometer metrics. These additional measurements enhance the data that the MCT transmits to the cardiologist, which then enhances diagnostic abilities. The GPS feature allows the physician to gather geographic data about where the patient was during different points in the data. The accelerometer provides a picture of the activity that the patient was engaging in at the time of an event. These features provide a broader scope and more detailed evidence that can help cardiologists understand the status of their patients’ heart function. Advancements that are easier to use, produce broader data spans and encourage patient compliance are all positive developments but must be tested. As a leader in the heart monitoring space, Telerhythmics is constantly testing and evaluating these technologies. This evaluation will help us determine which devices will be the most stable and beneficial for customers. It’s also important to remember that technology is only one piece of the equation. Ultimately, the most successful heart monitoring programs are those with the Cardiac Trained RNs using customized QA reports. Heart monitoring is increasingly a service that physicians are offering as part of their standard of care. Advances in mobile cardiac telemetry (MCT) monitoring are making it easier to provide heart monitoring services, and these advances are making the service more effective for patients experiencing heart related issues. With the growth in the market, physicians are seeing an increasing number of providers in the heart monitoring space. So how do you pick the right provider? We’ve put together a few tips on what to look for. It’s best to find a heart monitoring provider that takes a “device agnostic” approach to recommending technology. A firm or manufacturer with vested interest in a specific device might not give you the full picture of what’s happening in the market. Holter monitoring, 30-day cardiac event tracking, and mobile cardiac telemetry (MCT) are the three largest types of heart monitoring services. It’s important to know that there are many options under each of those three categories. Find a provider that will recommend the method and technology that is right for you and your patients – not the provider’s bottom line. Technology is great, and there have certainly been advancements in how data is collected. Data collection is important, but what happens with that data is even more critical. Before choosing a provider, you need to know who is monitoring the data. Do the providers you are evaluating employ Cardiac Trained Registered Nurses (RNs)? Do their RNs monitor all tests for quality assurance, or do they only provide periodic spot checks? In general, experienced cardiac trained RNs maintain a higher level of expertise than Certified Cardiographic Technicians (CCT), will produce higher quality assurance and reporting, and offer the most effective level of service. Find out who is reading your data before selecting a partner. How promptly are the reports delivered? Who creates the reports (software or a trained RN)? What flexibility is there in terms of report delivery (encrypted email, fax, web, HL7 interface)? Mobile Cardiac Telemetry (MCT) is a part of the emerging science of wireless monitoring in the health industry. Typically, MCT is used in the identification and treatment of heart conditions. Telerhythmics, LLC, established in 1997, is a 24-hour cardiac event monitoring service provider used on an outsourced basis by hospitals and physician offices. Based in Memphis, Tennessee, Telerhythmics provides its monitoring services nationwide. Their goal is to act as an extension of a doctor’s office or hospital system providing top-notch analysis of diagnostic data generated by a patient undergoing MCT monitoring, according to Telerhythmics Vice President and General Manager, Jason Callaway. Any patient reporting an abnormal heartbeat or chest pain to his/her physician is an ideal candidate for Ambulatory Cardiac monitoring. Indications for MCT monitoring include: asymptomatic arrhythmias, complete syncope, medication titration, post CABG and post ablation. In the past, 24-hour monitoring was the industry standard, but with improvements to wireless MCT technology, it is now much easier to monitor patients over a longer period — anywhere from a few days to a month. “Most arrhythmias that patients have, if they’re transient, don’t occur within a 24-hour or 48-hour period,” said Callaway. A heart monitor paired with a Bluetooth-enabled mobile device is all it takes for Telerhythmics to gather and interpret patient data. Once a doctor determines a patient would benefit from MCT, setting it up is easy. All relevant patient demographics and insurance information are collected when the heart monitoring device is applied to a patient by the doctor’s staff. Baseline diagnostics are collected and sent to Telerhythmics to ensure everything is working properly, and then patients are free to go about their daily business until it is time to return to the doctor for their results. The length of monitoring is at the discretion of the doctor. Diagnostic data is continuously recorded by the device. When an anomaly is detected, the device sends data from the preceding and following five minutes to the Telerhythmics monitoring center. The data is then interpreted by a qualified, cardiac-trained registered nurse. Telerhythmics provides 24/7 monitoring and quickly notifies doctors when abnormal patient diagnostics are detected. Through the duration of monitoring Telerhythmics compiles the data and interprets what is most relevant for the doctor to make a diagnosis. A comprehensive report will show all detected anomalies as well as provide comparative diagnostics with patient data that is automatically collected and stored every ten minutes regardless of whether an anomaly is detected. The doctor is then free to interpret the data and form a diagnosis as he or she sees fit. Above all else, Telerhymics is committed to facilitating top-of-the-line service from doctors to patients. With experienced cardiac nurses providing around the clock monitoring, physicians and patients receive the highest level of customized patient care.